Simply fill-in the information to the right and ckick on "Pay Now". This costs do NOT include uniforms. A player that is being transferred into a team is considered a new player. -- Team Registration: For a HYSA team to be registered (by Sunday, January 12) it must have a least 9 players registered for U12 and younger teams and it must have at least 12 players registered for U13 and older teams. The team must also have at least one adult registered and must fill-in the HYSA bracketing form . -- Returning HYSA Player Registration: all players already registered in the Fall of 2013 (Sept. to Dec). Coaches have to send a list of returning players to the club registrar (no form needed, just a list of players) along with the returning player registration fee. -- Players transferred out and into the team (also to drop players from team). Fill-in this form and turn it in to the club registrar. -- New HYSA Player Registration and EDDOA U11 and U12 teams: all players must fill-in the FC Houston Player Registration form , turn-in a copy of the birth certificate and the registration fee. -- Adult Registration: All teams must have at least one adult registered for the team to complete registration . -- Uniform Policy HYSA: All teams playing in the HYSA league must wear the club's jersey, per HYSA rules (look on the top right). These teams may wear their own shorts and socks. The HYSA player registration fee includes one club jersey free of charge (it has no number so each team will be responsible for putting the numbers). Each additional jersey will cost $15 each. -- Uniform Ordering: Just email juanvasquezani@yahoo.com and tell us how many and what sizes you want for your team. Each HYSA registered player gets a free jersey. The sizes available are Youth-Small, YM, YL, Adult-S, AM and AL. The club jerseys will be available August 28, 2013. 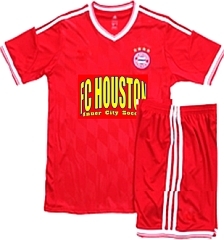 -- Uniform Policy EDDOA and Super-2: Teams participating in EDDOA and Super-2 may use their own uniforms and do not have to wear the FC Houston jersey. -- Referee Costs: In HYSA games, our teams will be responsible for the referee payment if the team listed as the "home" team. The referee fees are due the day of the game before the game starts. There are no referee fees when playing as visitors. There are usually 5 home and 5 away games during each season. In EDDOA and Super-2, the referee fees must be paid directly to them.